New European Flag… a Barcode? A Dutch artist by the name of Koolhaas has designedd a new European flag, this time a little more exciting than gold stars of a blue background. 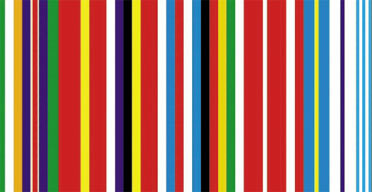 Although it appears that the EU aren’t falling over themselves to adopt it I thought it worth sharing, mainly since it does look like a colourful barcode; in fact more of a flag amalgamation. Any thoughts? And would it not have been more exciting if it also scanned? Can you find all the flags in it? If you want more barcode art then check out this previous blog or our website for trees pretending to be barcodes. A large amount of my day is taken looking at barcodes. Whether it be to try and work out why someone can’t get it to be read (“have you checked it actually is a barcode sir?”) or simply geeking up on something I have to say they do lose some excitement; if they ever had any. Therefore I found it fascinating when I came across this website with 12 examples of Barcode art. To see the mundane bars of data which I encounter every day used so differently was refreshing. Although some of them used the similarity to a cage there were several of them simply showcasing the strange, and very subtle, interest in the shape of a barcode. I don’t think I’d actually like the barcode Chandelier or Sofa (ouch) in my home or office but their existence somewhere is nice to know. This is not my first encounter with barcodes as art however; QR codes are used widely within the world of marketing and therefore interact with consumers in a way most barcodes do not. This inevitably leads to people trying to make them more appealing and more attention grabbing. It is not uncommon to see a barcode out of the usual black/white mould these days. Some take this one step further and turn the QR Codes into functional artwork as shown by this website which describes how. As a company who provide barcode reading software software this is essentially a nightmare as they are deliberately taking away the large redundancy provided by QR Codes which make them so effective. I have personally found several examples where so much data has been removed the barcode is no longer readable.It has also occurred to me that by turning the QR Code into art it becomes far less obvious to the consumer what they should do with it. Our website is covered with pictures of barcode type images appearing in nature, mainly of course in the form of tree lines. Check them out for yourself here.